After David “Rock” Feinstein turned in his solid Bitten By The Beast solo effort last year, I was pretty much expecting The Rods’ Vengeance to be more of the same. I mean, just look at these song titles. 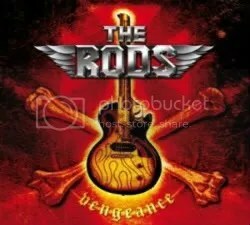 The Rods aren’t setting out to reinvent the wheel, all they want to do is crank out some rock solid heavy metal and that’s exactly what they’ve done on this release. As with Bitten By The Beast, the song on this album featuring Ronnie James Dio is the true point of interest (for me anyway). “The Code” could easily be from a latter day Dio album and I think I prefer it over the cousins’ collaboration on “Metal Will Never Die” from Bitten By The Beast. As for the rest of the album, there’s nothing here that’s going knock your combat boots off. Songs like “Raise Some Hell” and “I Just Wanna Rock” are typical heavy metal bashers but it’s 100% pure old school heavy metal and that’s good enough in the middle of the summer when you’re washing your car!